(BOSTON) — Synthetically engineered biosensors, which can be designed to detect and signal the presence of specific small molecule compounds, have already unlocked many potential applications by harnessing bacterial cells such as E. coli to sense toxins or enable bioproduction of valuable commodities including fuel, plastics, and pharmaceuticals. As of yet, however, scientists have been challenged to leverage biosensors for use in eukaryotic cells — which comprise yeast, plants and animals — because strategies-to-date are limited in the molecules they can detect and the signals they can produce. But now, a team of researchers at the Wyss Institute for Biologically Inspired Engineering at Harvard University and Harvard Medical School (HMS) led by George Church, Ph.D., has developed a new method for engineering a broad range of biosensors to detect and signal virtually any desired molecule using living eukaryotic cells. Church, who is a Wyss Core Faculty member and the Robert Winthrop Professor of Genetics at HMS, and his team reported their findings in the journal eLife. Strikingly, the team successfully engineered Arabidopsis plants to act as multicellular botanical biosensors, containing a custom LBD to recognize the drug digoxin and a luminescent signal protein to emit light when digoxin is “detected”. 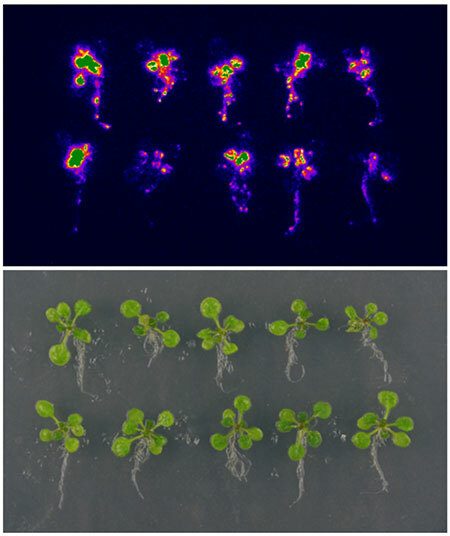 These Arabidopsis biosensors, grown by collaborators at the Colorado State University, gave off fluorescence when the plants were exposed to digoxin, proving that whole organisms can visually light up to signal detection of an arbitrary molecule. “These new reprogramming capabilities developed by the Church team open up an entirely new realm where ordinary organisms can be transformed into extraordinary living cellular devices that can sense specific signals and produce appropriate responses, whether its enhancing production of biofuels or secreting a therapeutic when the cells sense inflammation or infection. It’s another great enabling capability that will undoubtedly advance the entire field of synthetic biology.,” said Wyss Institute Founding Director Donald Ingber, M.D., Ph.D., who is the Judah Folkman Professor of Vascular Biology at HMS and the Vascular Biology Program at Boston Children’s Hospital, as well as Professor of Bioengineering at the Harvard John A. Paulson School of Engineering and Applied Sciences. In addition to Church and Mandell, other authors who contributed to the study include: co-first author Justin Feng of the HMS Program in Biological and Biomedical Sciences and the Dept. of Genetics; co-first author Benjamin Jester of the Dept. of Genome Sciences at University of Washington (UW) and the Howard Hughes Medical Institute (HHMI); co-first author Christine Tinburg of the Dept. of Biochemistry at UW; co-author Mauricio Antunes of the Dept. of Biology at Colorado State University (CSU); co-author Raj Chari of the HMS Dept. of Genetics; co-author Kevin Morey of the Dept. of Biology at CSU; co-author Xavier Rios of the HMS Dept. of Genetics; co-author June Medford of the Dept. of Biology at CSU; co-corresponding author Stanley Fields of the HHMI and the Dept. of Genome Sciences and the Dept. of Medicine at UW; and co-corresponding author David Baker of the HHMI and the Dept. of Biochemistry at UW. This work was supported by the Defense Threat Reduction Agency (DTRA), the National Institutes of Health (NIH), the Department of Energy (DOE), the Synthetic Biology Engineering Research Center (SynBERC) and the National Science Foundation (NSF).